I’m a sucker for flowers. Honestly, if I have any kind of spare time these days, I’m typically spending it in my garden, looking at other people’s gardens or simply browsing through pictures of gardens on Pinterest for inspiration. 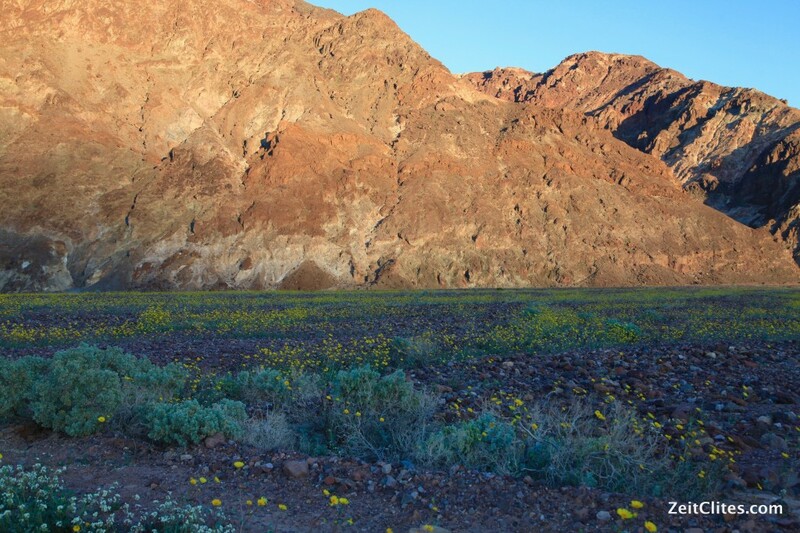 So when hubs forwarded me an article about Death Valley’s recent “super bloom” and suggested a day trip to witness the event ourselves, I was totally on board. 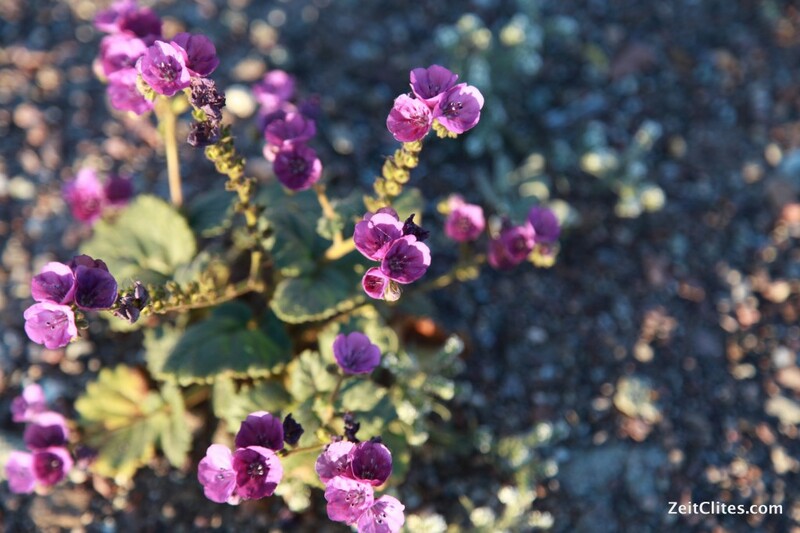 For those that haven’t heard, Death Valley is experiencing a rare mass-blooming event. 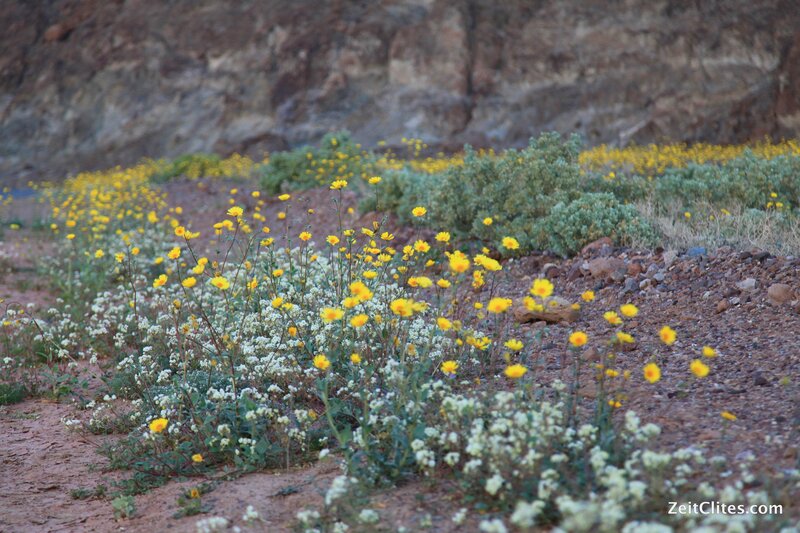 Because of the recent El Nino rains and warmer-than-average temperatures for February, the valley floor has erupted in great masses of wildflowers. Walking out into the wash.
Death Valley is an apt moniker for this alien landscape, part of the Mojave Desert. The lowest point in the park is 282 feet below sea level and sets records with temperatures as high as 134 degrees Fahrenheit. Most years it gets an average rainfall of just over two inches. 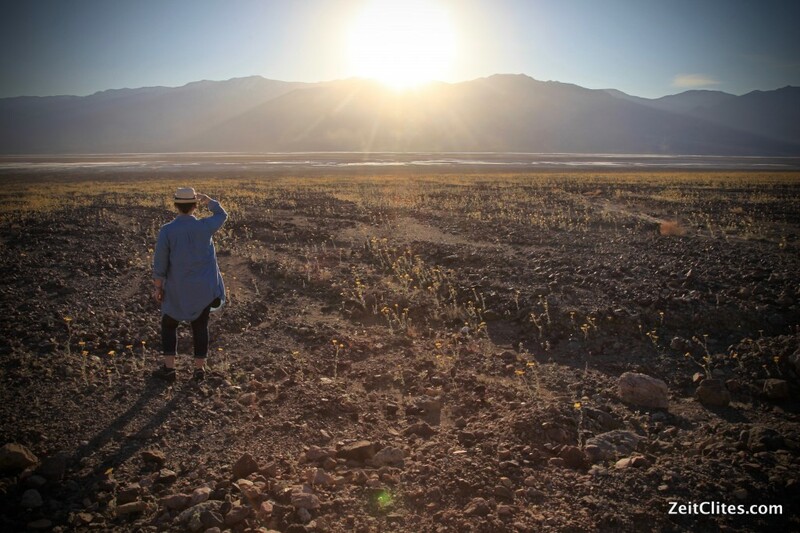 It’s a desolate place of rocks, long expanses of salt flats and scrubby little plants and bushes that have somehow adapted to these extreme conditions. 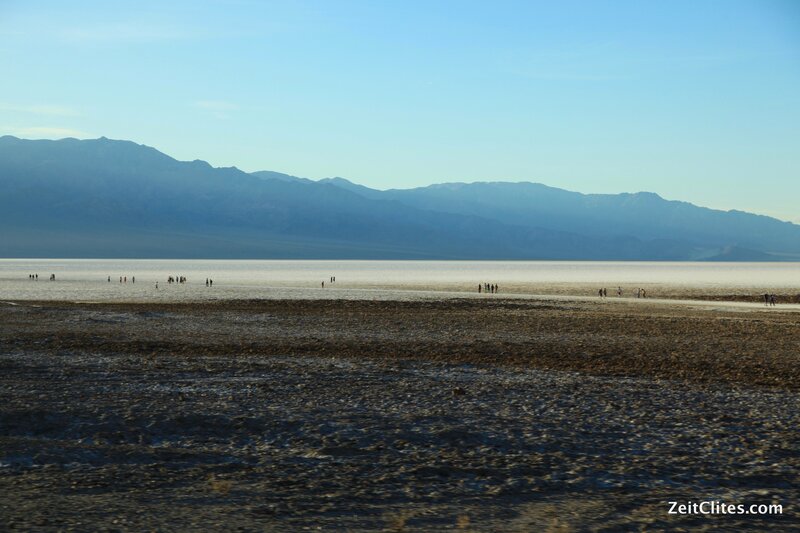 People in the distance walking onto the salt flats. But this winter something special is happening. 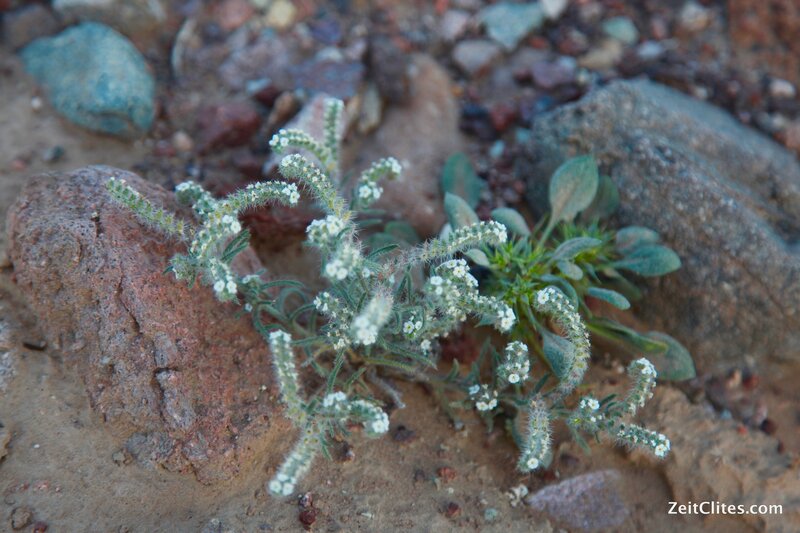 Millions of wildflower seeds that have lain dormant on the valley floor for years have suddenly burst into bloom, virtually overnight. The last time something similar happened in the park was in 2005, so some of those seeds have been patiently waiting there for over ten years. The landscape was dotted all over with tiny figures enjoying the rare flower show. 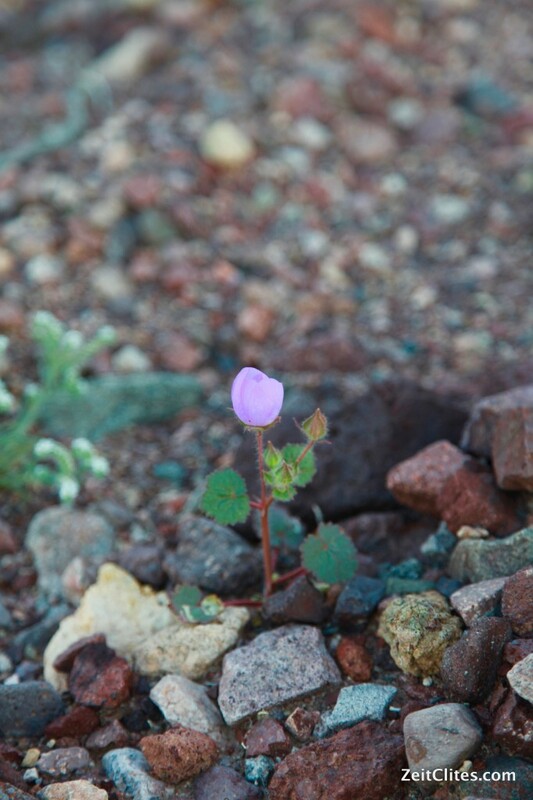 It struck me how much this super bloom event has in common with so-called overnight success stories. What the media often fails to mention is that in most cases that person has been toiling away for years, planting seeds and hoping that one day a “perfect storm” of events will blow through, providing just the right environment for those seeds to bloom and thrive. 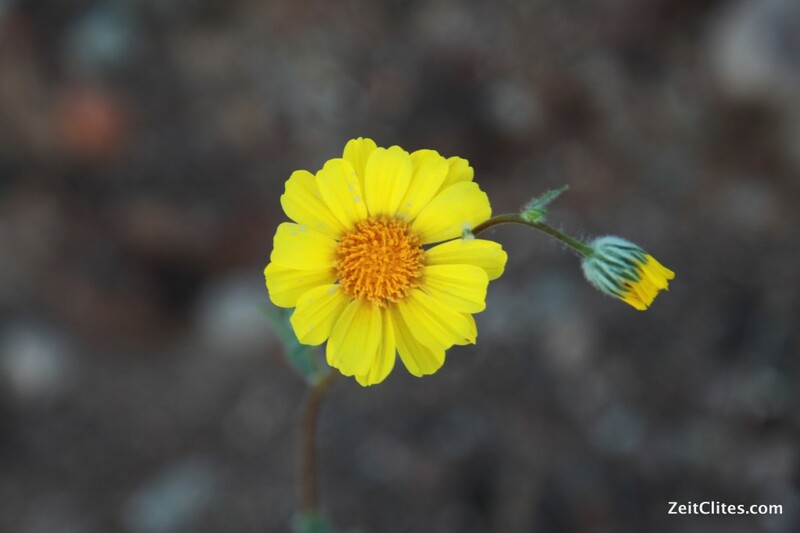 Up close and personal with the “Desert Gold” flower, the most ubiquitous one in the super bloom. If we keep striving, keep planting our own seeds by working on our own projects, and have the patience to wait for the right opportunity to present itself, we will have the chance to shine and thrive. The trick is to hang in there, even when the wait seems interminable. 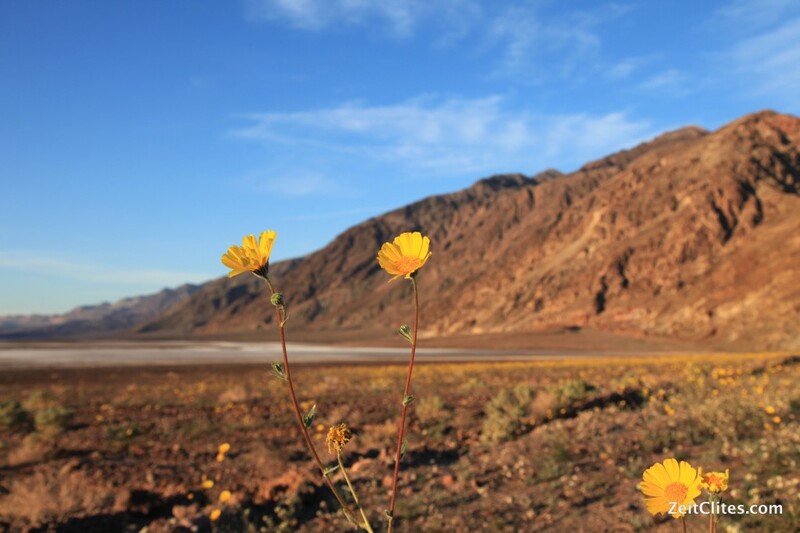 While we passed by these expanses of wildflowers, creating lakes of yellow, one thing surprised us – the flowers weren’t densely packed, as they appeared in the photos. There was probably about one flower per square foot, but when viewed together at just the right angle, it appeared seamless and creates a pretty spectacular show. Isn’t that a lot like life? We drop these seeds in our wake whenever we can. Each individual seed doesn’t feel like much. But when they all bloom at the same time, when our collective experience is viewed in one fell swoop, it’s pretty impressive. Each tiny piece of history is connected, creating the rich tapestry that is our lives. And then of course, there’s the knowledge that this super bloom event is temporary. In a few weeks, after the weather starts to heat up and the ground dries up, these flowers will be gone. In life, if you don’t create the right environment for your dreams to thrive, they, too, can die. It’s not a one-shot deal – you may be in the right place at the right time to have your dreams sprout, but it takes a lifetime of nurturing and diligence to sustain those dreams and to build on those accomplishments to have continued success. Go out there and plant your seeds! 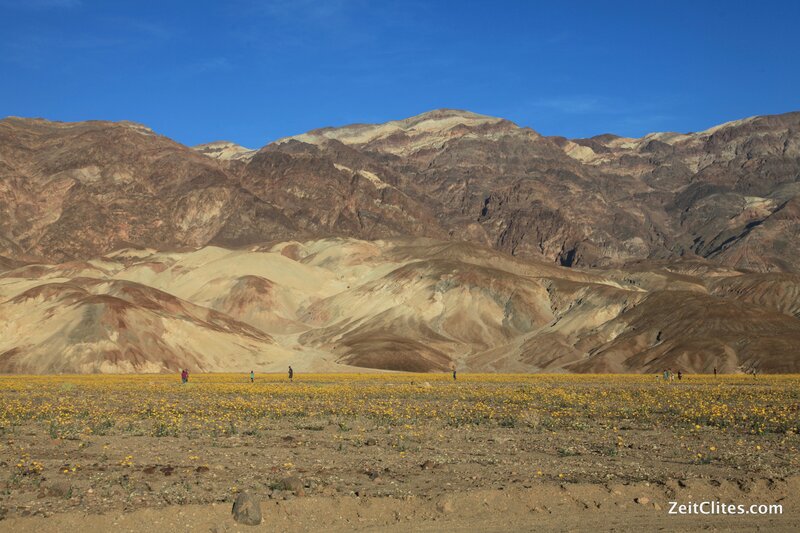 And if you want to witness the superbloom yourself, you best get out to Death Valley stat.